I don't feel I have really changed since Sept 11th. I still believe in human rights, free speech and freedom of religion for the whole planet (not just for westerners). And now we are in a war against the fascist enemies of human rights, of course I support that war, just as I would have supported the 1939-45 war. The left, it seems to me, has betrayed me. I always thought they hated fascism, and would support any war against it. And yet the test came and most of them failed it. It makes me doubt that these people would have supported the Allies in the 1939-45 war either. There are many people who are against the war who I never really admired. This page is about the people I really admired who let me down. 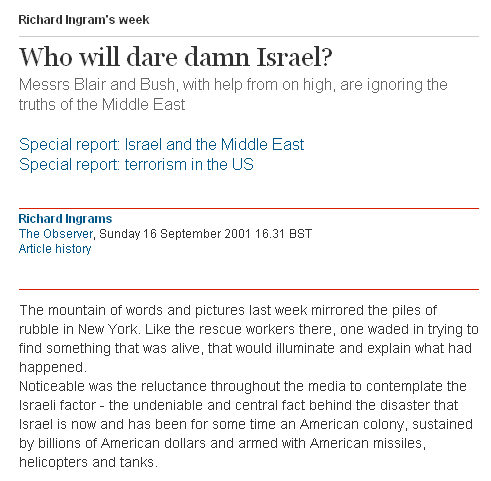 The Observer tries to cram 9/11 into a pre-existing left-wing framework, Sunday 16 September 2001.
Who will dare damn Israel? Every nutter in the world will. My reaction to this kind of thing was ultimately to leave the left - and to stop buying The Observer. Note that Richard Ingrams was the Editor of Private Eye from 1963 to 1986. The mathematician Sir Michael Atiyah, President of the Royal Society, is part Lebanese, and grew up in the Arab world. His father worked for the Arab League. It might be sadly predictable, therefore, that he marched against the liberation of Iraq, and believes that Israel, rather than the ideology of Islamism, is the root cause of terror: "The real fundamental cause of these things arises out of the Israeli-Palestinian problem. 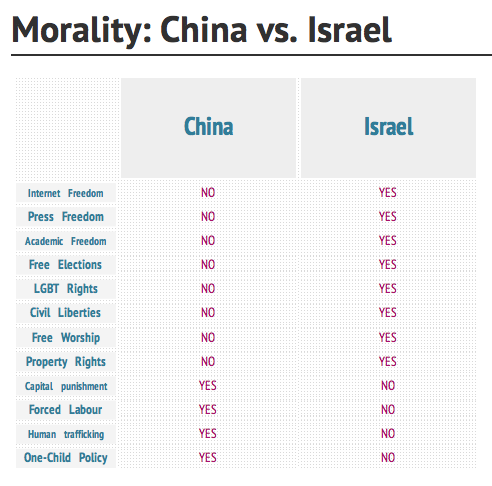 ... the Israeli-Palestinian thing is at the core of that. As long as that's not stopped in a satisfactory way, the problem will continue. It is the terrible irony of the world that the Jews suffered terribly during the war in the Holocaust, and now are in some senses the cause of the next Holocaust." The futurist and atheist Keith Henson writes well about memes and religion, but not so well about politics. Evolutionary Psychology, Memes and the Origin of War, Apr 20, 2006 (formerly here) tries to discuss Islamism, Iraq and war in general. Oddly enough, memes are the answer to the question of why ludicrous ideas like Islamism spread, and indeed why many (even most) wars start. Yet he resists this as the main answer, instead starting with the claim that "All wars arise from population pressure" and saying it is basically right. He says bad memes are triggered by economic conditions rather than just having a life of their own: "In short, humans go into war either because (1) "war memes" build up in a population looking at bleak prospects or (2) they are attacked." Surely as a memeticist he should know better. Memes can exist for no good external reason, just that they are good memes. There are many poor countries in Africa and across the world that do not generate international terror. There are specific reasons why the Islamic world does. And they are to do with memes, not economics. In fact, the modern Islamist revolutionaries are wealthy and educated (like most revolutionaries and killers in history). He claims democracies do not start aggressive wars because they have good economic conditions: "It is the effect of low birth rates and relatively high economic growth that has kept the democracies from starting wars." I disagree. Democracies do not start aggressive wars because of the structural nature of democracy and free societies. War, terror and democide are not correlated to economics. Rather they are correlated to the presence or absence of democracy and a free society. His writing is quite amoral. There is no sense in his writing that democracy is morally superior to non-democracy. Only that it has somehow produced better economic conditions, which reduce war. He claims the US liberation of Iraq was driven by fear and irrational emotion, thus nicely ignoring all the neo-conservative arguments for the Iraq war. Nice not to have to address them. And of course, like all leftists on Iraq, he has absolutely no positive solution for what to do next (he makes some "joke" about swapping the population of Iraq with that of Texas). Nov 2015: Bill Nye the "science" guy says that jihad is caused by climate change. Criticism of the Bulletin of the Atomic Scientists (and their Doomsday Clock). Bizarrely, National Geographic, of all publications, has a distorted anti-Israel bias, and whitewashes the Islamic Middle East. Free Inquiry let me down by taking an editorial line against the Iraq War. This is not an issue on which taking an editorial line is appropriate. This seriously damages the credibility of their magazine. On the Eve of War - more poor arguments by Dawkins, March 18, 2003. Secular Humanists Can Disagree on War with Iraq by Edward Tabash - An atheist who supports the war. He appears for the pro-fascist, pro-communist Stop the War Coalition. He quotes the discredited Lancet survey about 100,000 civilians killed by the US. Stephen Hawking joins boycott of Israel, May 2013. 2006: Stephen Hawking visits China. He never proposes boycotting it. 2007: Stephen Hawking visits Iran. He never proposes boycotting it. 2009: Stephen Hawking visits China again. He never proposes boycotting it. 2013: Stephen Hawking boycotts Israel. Raheem Kassam writes a fine Open Letter to Stephen Hawking, 8 May 2013: "Sadly, however, I now believe that you are the latest in a line of celebrities, academics and politicians who are being misled by the closed-minded, closed-shop style of debate that I know you to have rejected over the majority of your life." Neil deGrasse Tyson did an update of Carl Sagan's Cosmos series in 2014. But he too comes with politics. He had President Barack Obama introducing the new Cosmos series (ugh). For years, Neil deGrasse Tyson promoted a fake quote by George W. Bush in order to mock him. No one seemed to notice or fact check him. The fake quote was eventually spotted and exposed by The Federalist in Sept 2014. More here. The quote was meant to show that Bush was prejudiced against Islam. (Whereas, if anything, the opposite was the case.) As The Federalist showed, the fake quote was a garbled misremembering of a 2003 quote. Tyson's fake Bush quote has even been for years featured on his Wikiquote page. When the controversy blew up in Sept 2014, Tyson's response was pathetic: "I have explicit memory of those words being spoken by the President. ... Odd that nobody seems to be able to find the quote anywhere ... So I assure you, the quote is there somewhere. When you find it, tell me." More here. He eventually apologises, 30 Sept 2014. But with a lack of grace, if you ask me, considering how he mocked and ridiculed Bush. He doesn't have the guts to link to The Federalist. He doesn't seem to realise that The Federalist, not "others", found the 2003 quote. He has the arrogance of a man who does not take his critics seriously. Neil deGrasse Tyson and his fake Bush quote. Jump to 1:35. In the same Bush-bashing speech, Tyson also claims that the God "Allah" is the same as the Christian God. This is completely unscientific. How can two fictional beings be "the same"? Or at least, how can you state as "fact" either way whether two fictional things are "really" the same fictional thing or not. And yet Tyson uses this made-up "fact" to bash Bush as hostile to Islam. OK I never admired Ted Honderich anyway (or knew anything about him) so he did not "let me down". But I include him here because as a scientist, atheist and "humanist" you would think he would use some logic when it comes to terror. But no. He is an open apologist for Islamic religious terror. "It strikes me that the Palestinian's only hope is terrorism. That was their only means, which I absolutely believe without the slightest hesitation. ... The Palestinians are up against what is said to be the fourth largest military power in the world. Do they have much choice in how they respond to it? ... It could be that the Palestinian people do have reason to resort to the terrible weapon that is the suicide bomber. ... Yes, the Palestinians do indeed have a moral right to their terrorism against [neo-Zionism] in all of historic Palestine. ... It seems to me clear that the Palestinians have had and continue to have a moral right to their terrorism against the ethnic cleansing of Neo-Zionism. ... It seems to me that the Palestinians have a moral right to their terrorism against the ethnic cleansing of Neo Zionism in taking from them the last fifth of historic Palestine." He idiotically believes that Israel is the main cause of the modern Islamist religious jihad. Incredibly, he believes 9/11 was somehow about Israel and "support of the Palestinians": "The attack on America on 9/11 was monstrously wrong. It was wrong, according to the Principle of Humanity, because it was a monstrously irrational means to an end that was partly defensible. I mean support of the Palestinians and resistance to neo-Zionism." (*) Sierra Leone is 60 percent Muslim. But Malawi and Mozambique are 80 percent kafir, who Bin Laden regards as vermin. While Zambia is 99 percent kafir - the whole country could be exterminated as far as Bin Laden could care. An even funnier theory than Ted Honderich's idea that Bin Laden is angered by African poverty! At a London conference, Jan 2007, scientists identify one of the root causes of terrorism: global warming! Apparently this angers Bin Laden, or something. UN Secretary General Ban Ki-moon, June 2007, says climate change, not Islamism, is the cause of the 25 year Islamist genocide in Sudan. Funny how the "climate change" seems to have started in 1983. Holy God in heaven: "National Security and the Threat of Climate Change" - U.S. military study claims that global warming causes poverty causes the Taliban and al Qaeda. On page one they reference "failed states - the breeding grounds for extremism and terrorism." No, you fools. The ideology of Islamism is the breeding ground for extremism and terrorism. Poor, failed, hopeless countries that aren't Islamist don't attack us. Obama's National Defence Review ignores Iran and Islam in favour of .. climate change! by James Corum, 11 Feb 2010. The review spent 8 pages discussing "the security effects of climate change"! Bin Laden himself reckons there is mileage in this! In Jan 2010 he claims he wants to kill Americans because of climate change! (He's got a new reason every week.) Maybe he can get some useful infidel idiots on side with this one! Next week he'll claim to be angry about the lack of gay marriage. Bin Laden, reported 1 Oct 2010, claims to care about the recent floods in Pakistan. Not enough to condemn the jihadi threats to kill flood aid workers though. The mass murderer also - in the hope of making some dumb western lefties swallow this - cries crocodile tears about the environment: "The number of victims caused by climate change is very big ... bigger than the victims of wars". As if Bin Laden gives a toss about either! Smart scientists with naive politics have a long history. I admire Russell for his lonely opposition to World War One. He also deserves credit for his early (1920) recognition of the oppressive nature of Lenin and Bolshevism. But some of his later activities are less impressive. Russell's proposal to end the Cold War was a "world government" that would have included tyrants like the Soviets and Mao's China, directly ruling over us. In 1966 Russell set up the Vietnam Solidarity Campaign (VSC) and became its President. The VSC openly called for victory for the communist Viet Cong (NLF). Russell wrote to the communist butcher Pham Van Dong to offer his open support in 1966: "We are wholeheartedly in support of the valiant efforts of the people of Vietnam. ... We are fully committed to the victory of the people and the defeat and withdrawal of U.S. forces." Russell spoke on Viet Cong radio in 1966 to urge US soldiers to abandon their mission. Russell's Vietnam "war crimes tribunal" included as members the tyranny-lovers Jean-Paul Sartre and Tariq Ali, and discredited itself by focusing almost entirely on war crimes by the Americans, ignoring the far greater war crimes by the communists. Russell's last political statement, issued in 1970, was a condemnation of the democracy of Israel. Physics and Politics: The embarrassing but mostly harmless leftism of Albert Einstein (also here) by Ronald Radosh - On Einstein's hopelessly naive left-wing politics, which at times bordered on apology for the Soviet Union. "The unfortunate truth is that Albert Einstein was as gullible on the Cold War as the average college leftist." Carl Sagan is another wonderful, soaring scientific thinker who has naive ideas about the human world. Too Smart To Be So Dumb by Joel Engel, 27 May 2003 - on the mysterious relationship between intelligence and politics. Is the atheist who understands evolution likely to have better political ideas than, say, the mainstream Christian? The story of my lifetime is that the answer is no, not necessarily. The relationship between intelligence in dealing with factual issues and intelligence in dealing with humans (especially human enemies) is not very clear. Reagan was a religious conservative. He dragged God into everything - see his 1983 speech in Orlando. He was a creationist - a belief that can only be held by the truly ignorant and incurious. He believed in prophecies, and Armageddon. He allowed astrology to influence his decisions. And yet, Reagan is one of the few Presidents I would ever quote. He was incredibly intelligent politically. He understood human nature. He had a good moral compass, and recognised evil when he saw it. As a result, he killed the Soviet Empire and liberated Europe. Likewise, consider George W. Bush. Also a religious conservative, also a creationist, who dragged God into speeches. But also a man with a moral compass. (In contrast to, say, Rowan Williams.) Bush was a man who understood jihad far better than Obama did. A man who understood immediately what Arafat was. A man who destroyed the Taliban and Saddam. His intelligence about humans compares favourably to, say, Clinton, who was completely fooled by Arafat. On the Middle East, I would prefer George W. Bush to Richard Dawkins any day. It's all very mysterious. Who's Smarter? Bush & War Cabinet or Hollywood Stars? by Cindy Osborne, March 2003 - lists the education records of members of the Bush administration, and the education records of some of the celebrity "anti-war" left. Now I agree it is pretty dumb for any adult not to believe in evolution. And yet I still prefer Bush to Clinton, or (god help us) Obama. The relationship between intelligence and politics is mysterious. And we know even the anti-Bush types like Doonesbury apply this argument selectively. We know they never gave Carter a hard time for his creationism. And they never cared what grades Obama ever got. Pseudoscience Vs. Snobbery by John Derbyshire, 22 Apr 2003: "I myself do believe in evolution ... The main anti-Darwinian hypothesis .. seems to me highly improbable. It seems to me, in fact, to be pseudoscience ... I'm not very intensely religious. ... [But] The argument .. that George W. Bush is unfit for the Presidency because he does not believe in the theory of evolution .. leaves me utterly unimpressed. ... while, speaking as a scientifically-educated person who prefers truth (so far as we can discover it) to falsehood, I would rather you believed in evolution than not, I think there are a great many other things that are much more important." Kurt Vonnegut praises jihadi suicide killers of women and children. I thought John le Carré was another person who let me down, when I read his crackpot anti-American views on the current war. John le Carré is Mr Angry now that Smiley's day has gone by Daniel Johnson, Daily Telegraph, 2 Dec 2003. John le Carré's anti-Bush letter to Americans, 2004. I thought he had changed, but that was because I was under the mistaken impression that he supported the West in the Cold War. I never liked his novels you see, and never read one through. But it turns out he was full of moral equivalence in the Cold War too, and empathised with those who defected to the Soviets. John le Carré's reply to the above article makes it clear he was not a believer in communism, only in moral equivalence. Why I despised "Tinker, Taylor, Soldier, Spy" as a child - and still do by Paul Marks, 14 Sept 2011. He points out that none of le Carré's spies seem to actually believe in the West. The guy working for the West does not seem to believe in the West. The guy working for the Soviets does not seem to believe in the Soviets. "there is no reason for the treason of "Bill" and no reason for the loyality of "George". Both are characters who make no sense at all. ... So it came as no shock to me when the author of this story turned out to share many of the ideological assumptions of the enemies (both external and internal) of the West." The Campaign of Hate and Fear, November 16, 2003. I have little in common with him on religion though. He is a devout Mormon. It has also been pointed out to me that he has unpleasant views on homosexuality. I'm losing patience with my neighbours, Mr Bush. This smartass disputes that Saddam is a mass murderer: "As for Mr Patel, don't ask me how I know, I just know - from very good sources - that he is, in reality, a Mass Murderer." And now for something completely stupid - The definitive take-down of Terry Jones, by Chris Newman. The parody at the end is of the witch scene in The Holy Grail. Terry Jones Goes On The Enemies List With John Pilger and Robert Fisk - "I will say a prayer every day from now on thanking God this moron isn't running Britain." Terry Jones sneers at the first, glorious, emotional Iraqi election in 2005. Terry Jones, 2006, slurs the US military by claiming they target civilians: "it wasn't an army that Julius Caesar massacred, but a whole population including women, children, old and sick, which, I suppose, is one thing that George W Bush and Julius Caesar do have in common: pretending civilians are armed insurgents." He provides no evidence for this. Jones also claims that all Iraqis killed by jihadis were actually killed by Bush: "Julius Caesar counted his dead, whereas George W Bush can't be bothered. ... So the fact that he still sticks to an estimate of only 30,000 dead Iraqis, even when a recently published study in the Lancet suggests he's slaughtered at least 655,000 ..."
Terry Jones, Oct 2011, admits he could not make a Life of Brian about Muhammad: "Asked if he would make a satirical film about Muslims now, he replied, 'Probably not - looking at Salman Rushdie. I suppose people would be frightened.'" And yet he still has no clue about the global jihad: "I think it's whipped up by the arms industry. I read an in-house magazine called Weapons Today before the Gulf War and the editorial was headlined, 'Thank God for Saddam' and went on to say that since perestroika we have an enemy no one can complain about. So in future we look for Islam to replace communism. I thought they were joking - the Crusades were 1,000 years ago - but of course that's what's happening now." What a fool. In contrast to Terry Jones, the heroically brave Ayaan Hirsi Ali says she wants to film the Muslim "Life of Brian". Scott Adams of "Dilbert" fame wrote a hard-to-understand "comical" piece about Iran and Israel that does make him look like a left-wing nut. I certainly agree with this comment: "Without reference to earlier work, it would be impossible to see if Scott Adams was a member of ANSWER, CAIR, a follower of David Duke or some college friend of Dylan Avery." But see this clarification: "While I think it's highly unlikely that Iran would ever nuke Israel ... the odds are not zero. In my opinion, Ahmadinejad's speech at Columbia, plus Iran's support for Hezbollah give Israel a legitimate reason to attack Iran in self defense. ... Likewise, Ahmadinejad didn't deny Iran is helping Iraqi insurgents kill Americans. That's a legitimate reason for the United States to support an attack on Iran. It's a separate question as to whether an attack on Iran is in America's best interest." More here. Adams isn't a left-wing nut. He's just a bad writer (when he writes about politics). The great John Cleese is a boring Bush-basher too. This is an interview in Oct 2008. Apparently after Condoleezza Rice and Colin Powell, Americans need to elect Obama to prove they are not "racist". John Perry Barlow (and original post) was a prominent Internet libertarian of the 1990s, expressing the excitement of this new world. But now he is just another 1990s Rip van Winkle. The 90s are over, John. It's a shame, but they are. There's a war on, and starry eyed young men who want to kill us. It's a pain. I wish we were back in the 90s too. Nobody wants to deal with these bastards. But history didn't end. We've got to destroy these people if we want to have another 90s again. Letter To John Perry Barlow From A Pot-Smoking Deadhead Bush Voter (and original post) by Dean Esmay, 9 Nov 2004, speaks for me too: "from where folks like me stand, it's your ideas that need to be questioned, and it's you guys who have been on the wrong side of human rights and progress these last couple of years. It's you guys who are the reactionaries." In contrast, Louis Rossetto of Wired gets it: "Bush may be wrong about everything else, but he is right about the issue that matters most for my children's future: stopping Islamic fascism. And [Kerry and the Democrats] are just a joke, preferring to act as though this probably generation-spanning war is about politics, not the survival of the West." Richard Dawkins (doesn't seem to care that we are at war with Islamist religious lunatics who want to kill all atheists). Robin Cook - Now that America is abandoning realpolitik and adopting an ethical foreign policy, he's suddenly against it! Help, I'm a pro-war leftie by Oliver Kamm - "Long before 9/11, [Blair] abandoned the conservative "realism" - more accurately, amoral quietism - that had characterised John Major's foreign policies. Rather than acquiescing in Serb aggression, Mr Blair confronted it. ... Contrary to the Liberal Democrats' depiction of it as the biggest foreign policy error since Suez, Iraq was the most far-sighted and noble act of British foreign policy since the founding of Nato. Mr Blair's record exemplifies foreign policy "with an ethical dimension"." David Norris (doesn't seem to care that Islamists are the major killers and torturers of homosexuals and lesbians in the world today). Nelson Mandela (doesn't seem to care that Islamists are the main slave-traders of black Africans today). Amnesty International (doesn't seem to recognise that America's "Axis of Evil" Islamist and communist enemies are by far the major abusers of human rights in the world today). Reporters Sans Frontieres allows trendy left-wing politics to dictate which countries they get worked up about, rather than examining the actual state of press freedom. Pope John Paul II (a great defender of the West against the Soviets, today he doesn't seem to recognise that the Islamists want to end Christian Italy). "Mickey (12)", whose arguments are no more infantile than the rest of the "anti-war" brigade. Steve Biddulph is great when he writes on the importance of families, men and fathers. Yet listen to this when he wanders off topic in the Foreword to the UK edition of Manhood, 2004: "We are still a civilisation going to hell in a handbasket of materialistic greed. Our current almost hysterical obsession with terrorism seems rather ingenuous, given that our relationship with the undeveloped world is almost entirely one of theft. Fair trade, debt reduction, no longer propping up vicious regimes because they are someone we can do business with are the only real solutions to the eternal risk of terrorism.". A mish-mash of nonsense ideas leading up to one gloriously mad sentence in which he combines two of the most common stupid ideas in politics and economics - the idea that poverty is the cause of terrorism, and the idea that the solution to poverty is fair trade and debt relief. So fair trade and debt relief are supposed to stop the jihad now? And this is said for no apparent reason at all! It has nothing to do with the book! This is only page 3 and he is trying to repel the reader, saying "If you want to read this book, you need to buy into my crackpot economic and political ideas". Why doesn't he stick to the topic? Andrew Keen did something similar in his book The Cult of the Amateur: How Today's Internet is Killing Our Culture (2007). To agree with his thesis about the Internet, you had to agree with his standard left-wing views about the Swift Boat Vets, the Iraq War, and so on. He says he lives in Berkeley, which probably explains his myopia. I Bought The Guardian Today - So You Don't Have To, a blogger writes in November 2003 - "As a public service, I gritted my teeth and actually bought a copy of The Grauniad this morning, for the first time since the autumn of 2001." This is also my relationship with The Guardian, The Independent and The Irish Times since Sept 11th. Before Sept 11th, I read them all the time. I had been reading The Guardian and The Independent for 10 years, and The Irish Times for 20 years. Since Sept 11th, I tend to buy other papers. The Guardian, The Independent and The Irish Times are like old friends who have gone mad and I hardly recognise them any more. If they want me to buy them again, they need to change. It is a universal truth that those born with democratic spoons in their mouths will rail against the ruthless removal of a barbaric tyranny. Most of the people demonstrating against you will be the latte-rati - people whose experience of oppression is having to wait four hours for the cable guy to come round. I am the child of two refugees from totalitarian regimes; (*) for this reason, you need not fear a comedy terrorist attack against your intervention in Iraq. I don't care why you got rid of Saddam, and neither does any Iraqi I know. (*) His mother is a Jew who fled the genocide-state of Croatia. His father a Jew who fled the genocide-state of Austria.